Jazz Arts Group honors the legacy of two all-time jazz greats when the Columbus Jazz Orchestra presents “100 Years of Buddy Rich & Dizzy Gillespie” at the Southern Theatre February 15th through 18th. Showtimes and tickets are available here. Along with the big band majesty of the CJO, these concerts will feature two special guests: Two-time Grammy®-nominated Italian vocalist, Roberta Gambarini, and jazz drummer extraordinaire, Jeff Hamilton. Beyond their four concert appearances, Gambarini and Hamilton will also participate in the Offstage at the Academy series of conversations with featured performers on Saturday, February 17th at 2pm at the Jazz Academy offices in the Lincoln Theatre – details and reservations for this free event are available here. World-class drummer and educator Hamilton, whose Trio is releasing their new album Live from San Pedro on February 16th via Capri Records, was kind enough to answer our questions about the concert, Columbus memories, and his current activities – Keep reading to learn more. I’m excited for your upcoming performance with the CJO honoring Buddy Rich & Dizzy Gillespie! How have these jazz giants influenced your career and your understanding of jazz? 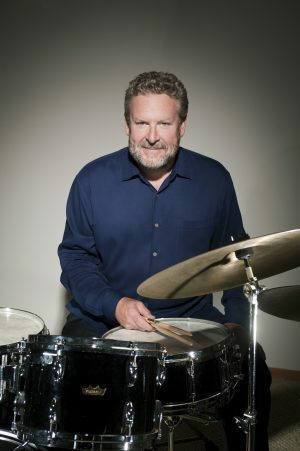 Jeff Hamilton (JH): Buddy was a big influence in my early teens due to the fact that I had was studying rudimentary snare drumming. Buddy’s solo style fit perfectly with what I was learning. I later became more aware of his earlier playing with Dizzy, Oscar Peterson among many others. His time feel felt so good to me when I played along with those earlier recordings. A lot of folks overlook that part of his playing. My studying Buddy culminated with us sharing the stage in a battle of the band’s in July of ‘77…Woody Herman’s Thundering Herd & Buddy Rich’s Big Band. Being an inventor of Bebop, Dizzy influenced so many players. I aspired to play with bassist, Ray Brown, who played in Dizzy’s Band in his late teens. Spending 18 years in various groups with Ray gave me so much insight into how Diz looked at music and life in general. He always had fun on the bandstand but was also serious about the music and demanded 100% from the players. I was fortunate enough to play with Dizzy twice. You’ve been part of many great performances in Columbus over the years. Do you have any favorite memories or experiences from your time here? JH: I played the Major Chord with the Ray Brown Trio about 25 years ago. It was a brief Midwest stop for us, but I remember that night being a good one. A lot of colleagues came out and helped provide good energy in the room. Also, the PASIC events were hosted there by my good friend, Jim Rupp. One year was a tribute to the drummers of Woody Herman. It was such a wonderful and inspiring reunion of our peers who held that distinction of being with Woody’s band. I enjoyed hearing a track recently from the forthcoming Jeff Hamilton Trio – Live from San Pedro release. How did that album come together and what was the recording experience like? JH: Tom Burns, the president of Capri Records, felt it was time for us to record a live CD. The CHJO has recorded at this venue with great success including a Grammy nomination. The acoustics and intimacy were just right for a live recording. Embarking on our 18th year, Tamir Hendelman, Christoph Luty and I had been compiling new material that we had been playing on tours and felt like we were ready to document it. After all, a recording is a snapshot of where you are at the time. Do you have any plans for tours and projects coming up in 2018? Do you have any advice for young drummers/students thinking about getting into jazz? JH: My advice for young folks in general is to select something you are passionate about and believe in yourself that you can achieve what you wish. If you are dedicated and focused, why shouldn’t you be the one to get where you want to be? For more on Hamilton, visit hamiltonjazz.com.